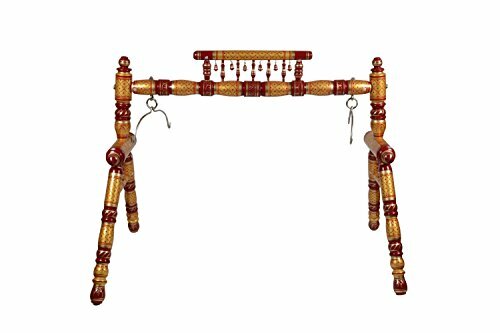 Traditional Indian ghodiyu/ shola handmade wooden baby cradle swing with hammock the 'ghodiyu' word originated in Gujarat. This is a swing framework with a pair of legs on two ends of middle rod. This design has been appreciated and recommended by many people. Typically, a ghodiyu is designed to have a low ' center of gravity ' which enables a person to swing the child back and forth. People in India have used this type of device for hundreds of years, so that their baby can fall asleep quickly, nicely and get the rest they need while developing proper sleeping habits. Indian people believe that the rocking motion soothes and relaxes the child and puts them to sleep quickly by replicating the comfort and security of the womb. Indian mothers believe that using a ghodiyu for their infants is also helpful in avoiding Sid and colic cases as the rocking motion relaxes the baby. If you have any questions about this product by Movie Time Video, contact us by completing and submitting the form below. If you are looking for a specif part number, please include it with your message.